Jim Weston during his Baker Perkins CC days. One of Peterborough’s best all-round cricketers passed away at the weekend. 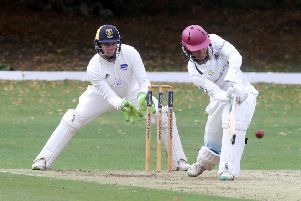 Jim Weston, the youngest of three top-class cricketing brothers, was a stalwart for Baker Perkins CC and APV Baker CC before moving onto Market Deeping CC in the latter stages of his career. Weston was a crafty slow bowler and hard-hitting batsman. He played alongside brothers Alan and Ron in a powerful Baker Pekins side for many years. He also played county cricket for Hunts. Weston was also a low handicap golfer for most of his life and a long-standing Milton Golf Club member. Market Deeping skipper David Gillett said: “It’s very sad news. Jim joined us towards the end of his career, but he was still a very good player. He was with us for five or six years and proved to be a key player in the best side the club has ever had in the mid-to-late 1990s. “He was a difficult opponent as well. Jim didn’t turn the ball much, but he was a very intelligent bowler who varied his pace so well he was always hard to score off.